- ROYAUME-UNI : Cottingham - Offshore wind farms could help reveal the ancient secrets of East Yorkshire. Archaeologists believe plans to connect a network of huge wind farms in the North Sea to an existing sub-station in Cottingham offer the chance to unearth dozens of previously unknown settlements. Recent underground gas and water pipeline schemes in the area had revealed over 50 previously unrecorded settlements, monuments and ancient burial mounds. Geophysical surveys and subsequent trenching and excavations uncovered over 50 Iron Age and Roman settlements and burial sites. Archaeologists also discovered evidence of major flint-working site near Wawne thought to date from at least 4000 BC. - ALLEMAGNE : Heuneburg - Scientists have found a 2,600-year-old aristocratic burial site at the Celtic hill fort at Heuneburg in Baden-Württemberg. The noblewoman's tomb, dating from early Celtic times, measures four metres by five metres, and is exceptionally well-preserved. 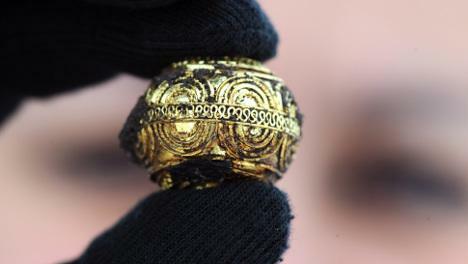 It contained gold and amber jewellery that makes possible for the first time the precise dating of an early Celtic grave. Using heavy cranes, the excavation team lifted the entire burial chamber out of the ground as a single block of earth and placed it on a special truck so that it could be carried off for further analysis. The Heuneburg hill fort site is considered one of the most significant archaeological sites in central Europe and possibly the oldest settlement north of the Alps. It has been the focus of intense interest because it reflects socio-political developments in early Celtic Europe when, after about 700 BC, wealth, population and political power began to be concentrated in small areas. It was the area of a large settlement from about 700 BC and became one of the key centres of power and trade in southern Germany. - U.S.A. : St Louis - Archaeologists who have found the remains of a prehistoric city beneath present-day East St. Louis have also uncovered a mystery: Why did Native Americans abandon the city of 3,000 or more people around the year 1200? A much larger settlement to the east — at Cahokia Mounds, center of the Mississippian culture — would survive 200 more years, experts say, before it also ended abruptly and inexplicably. One thing is clear from the archaeological work begun in 2008 ahead of the construction of a new Mississippi River bridge — the East St. Louis settlement was ravaged by fire in the late 1100s. An attack from outside, rioting or a ritual burning are among theories for the cause of the blaze. But nobody knows if the blaze ended the community. Continuing archeological investigation may provide more clues. No one knows what those Indians really called themselves. Mississippians is a modern name given to provide a frame of reference. Cahokia Mounds, not near the present-day city of Cahokia, was the administrative center for the mound-building Mississippians, who flourished from around 700 to around 1400 over a vast reach of what is today the Midwest and Southeast. In 1100, Cahokia Mounds had approximately the same population as London: 15,000 to 20,000 people. The United States would have no city as populous until Philadelphia in the late 1700s. The stockyards, which opened in the 1870s and operated for more than a century, probably destroyed or damaged some archaeological history but left much to be discovered. Last year, an extraordinary 3 1/2-inch figurine of a woman holding a cup or dipper was found only about an inch from a manure drain installed at the stockyards more than 100 years ago. The sites of more than 300 Mississippian homes and several hundred storage pits have been excavated. Workers have found numerous axes and arrow points, along with pieces of pottery and other evidence of the people's everyday lives. 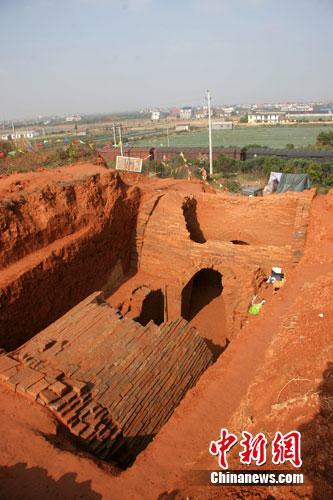 - CHINE : Longyou - An ancient tomb dating back to the Three Kingdoms period (208-280 A.D.) was unearthed recently in Longyou County, east China's Zhejiang Province. The especially large tomb has a 14.7-meter-long grave pit and its tomb chamber, built with bricks, has a length of 12.4 meters. Although the tomb had been raided right after the owner of the tomb was buried, there were still some articles made of pottery unearthed. Hence, the tomb has a great academic interest, according to experts. Judging from these unearthed relics, the tomb can be traced back to the Three Kingdoms period. - EGYPTE : Soknopaiou Nesos -This week, the archaeological site of Soknopaiou Nesos in Fayoum was a hive of activity. Workers along with Italian and Egyptian excavators were busy brushing the sand off a large collection of 150 Roman Ostraca (a clay fragment engraved with ancient Egyptian writings) engraved with demotic text. Each ostracon is inscribed with the name of a priest who served in the Soknopaios Temple. “It is really a complete archive that highlights not only the names of priests who served in the temple during the Roman era but religious practices and the prosopography of Greco-Roman Egypt as well,” said Zahi Hawass, secretary general of the Supreme Council of Antiquities (SCA). For his part, Mario Capasso, director of the Italian mission, from Università del Salento, suggests that the newly discovered ostraca were originally kept in a storeroom situated in a courtyard in front of the Soknopaios Temple, which makes him believes that it was thrown out of the temple during a clandestine excavation at the end of the 19th century. Further studies on the newly discovered ostraca will reveal more of the site’s history and religious aspects. Soknopaiou Nesos is a very important site for the understanding of Greco-Roman society in Egypt because of its excellent state of preservation and the amount of papyri and other inscribed material found at the site. Civilisation at the site reached its peak during the first and second century AD as it sat along a major trade route. In addition to the Ptolemaic temple of Soknopaios, the site is well known for a collection of sphinxes, as well as Roman and demotic papyri. - ULSTER : Dunnalong -Remains of a 410-year-old fort have been discovered on the banks of the River Foyle. The bastion fortification was built by Sir Henry Docwra in 1600 at Dunnalong, near Strabane in Co Tyrone, as part of his efforts to gain control over the Irish chieftains. University of Ulster researchers used aerial laser technology to reveal the Plantation-era settlement, which even included a brewhouse to provide beer to the settlement downstream at Derry. UU researcher Rory McNeary said: "This was a substantial fortification in its day comprising a five-sided enclosure with four bastions, all the buildings associated with a sizeable garrison, the re-fortified and ditched strong-house formerly belonging to the O'Neills." He said there was a market-place as well as brew-house. The researchers have to analyse the remaining earthwork, which is still buried deep beneath the ground. Sir Henry was sent by Lord Mountjoy to occupy and fortify the town with a large force of men. His main task was to keep in check the Ulster chieftains and try to get them to cooperate with the Crown. He landed virtually unopposed at Culmore on 16 May and, after fortifying the existing castle there, marched to Derry several days later. Eventually the area became part of the estate of the Earl of Abercorn. - U.S.A. : Vicksburg - A message placed in a corked glass vial dating back to the Civil War was finally decoded 147 years after it was originally sent. The intended recipient was Confederate Lt. Gen. John C. Pemberton, who was under siege in Vicksburg, Miss., by the forces of Union Maj. Gen. Ulysses S. Grant. Pemberton's troops, more than 30,000 Confederate soldiers, were eventually defeated. The Siege of Vicksburg would essentially split the Confederacy in half and became one of key turning points of the Civil War. The message was dated July 4, 1863, the same day of Pemberton's surrender. The encrypted note was deciphered with the help of the CIA codebreaker David Gaddy and later confirmed by a Navy cryptologist. Had the note reached Pemberton, it wouldn't have brought him encouraging news. The six-line note tells Pemberton that reinforcements would not be forthcoming to help the beleaguered general weather the siege. The full message reads: "Gen'l Pemberton: You can expect no help from this side of the river. Let Gen'l Johnston know, if possible, when you can attack the same point on the enemy's lines. Inform me also and I will endeavor to make a diversion. I have sent some caps (explosive devices). I subjoin a despatch (sic) from General Johnston." - VIET-NAM : Con Tang / Con Dai - Thousands of artifacts dating back to prehistoric age and the Sa Huynh Culture (a culture in central and southern Vietnam that flourished between 1,000 BCE and 200 CE) excavated from Con Rang and Con Dai archaeological sites are stored in a dilapidated warehouse belonging to the Thua ThienHue Museum of History and Revolution. "Local researchers just focus on the Nguyen Dynasty, forgetting and ignoring other periods, including the prehistoric age," researcher Ho Tan Phan said.